James Mason, a friend of Katie’s sister Lydia and godfather to her son Danilo, took on the onerous task of running in the 2016 Robin Hood Half Marathon for KHMT and The Cardiac Support Group (Nottingham). 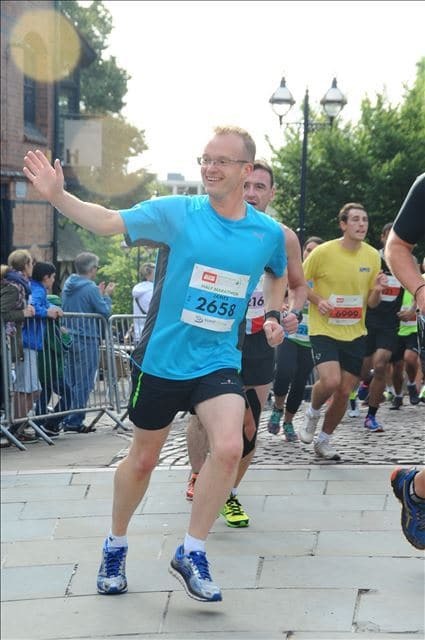 James says: “Having been convinced to enter the Robin Hood half marathon by our neighbours (who are keen runners), I soon realised that more could be gained from a recent boost to my fitness and a hug change in my commitment to exercise. The local cardiac group that my Dad chairs, after his heart attack over 20 years ago, was a natural choice. Then, after a holiday with our wonderful friends Lydia and Michele, whose lives will be forever affected by the loss of Katie, I knew KHMT must benefit from it too. It would be another way of getting the word spread of the dangers of Carbon Monoxide to the people around us, whilst also allowing work to take place at a national level through campaigning with the sponsorship money. Knowing I was supporting the Trust was a hug motivation to me to keep pushing myself and produce my best time on the day. I’ve never taken on a challenge like this before but now I’ve had a taste of it, I’m sure I’ll be taking on more in the future.” James raised an incredible £641.06 for KHMT alone!